Separately, a NATO airstrike reportedly killed 13, including 10 children, in northern Afghanistan. A devastating Taliban attack over the weekend on an Afghan army outpost in southern Helmand province killed 26 soldiers and seven policemen, a provincial official said Monday — casualties the country’s defense ministry has refused to disclose. Separately, the United Nations said Monday that a NATO airstrike over the weekend in northern Kunduz province killed 13 civilians, including 10 children. According to the UN Assistance Mission in Afghanistan (UNAMA)’s preliminary findings indicate that those killed were “part of the same extended family whom were displaced by fighting elsewhere in the country.” UNAMA’s statement noted that the incident took place in the Telawka neighborhood close to Kunduz city. NATO did not comment on the strike and it was not immediately clear if it was related to fighting Friday in the Gul Tepa District in the outskirts of the city of Kunduz, the provincial capital, in which two U.S. soldiers were killed. 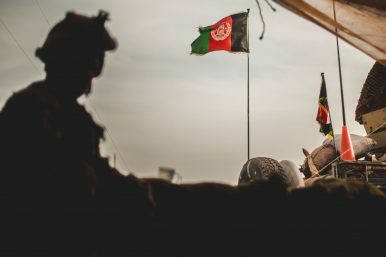 The attacks — and the fact they were not reported by the embattled Afghan government — underscore the challenges in efforts to resolve Afghanistan’s 17-year war, America’s longest. The Taliban stage near-daily attacks on Afghan forces, inflicting staggering casualties, even as they hold peace talks with the United States. According to Helmand council chief, Attahullah Afghan, the attack on the army outpost took place in Sangin district on Friday. Along with 33 fatalities, he told The Associated Press at least 31 soldiers were wounded. The Taliban claimed the attack a day later but the government remained silent. On Monday, Afghan military spokesman Nawab Shah said only that government jets had aided the besieged troops and eventually sent reinforcements to Helmand, an old Taliban heartland. He refused to discuss casualties. A second Taliban attack in Helmand targeted a public ceremony on Saturday in the provincial capital, Lashkar Gah, killing at least four people, including a provincial official, said Omar Zwak, spokesman for the Helmand governor. Yet another attack in Helmand, this one on Sunday, killed five policemen, said Zwak. Following the airstrike in northern Kunduz province, residents of the area held a protest, carrying several of the bodies. The airstrike was apparently in support of Afghan troops battling the Taliban, the U.N. statement said. Earlier this month, Washington’s special envoy Zalmay Khalilzad and the Taliban held a 13-day round of peace talks in Qatar, where the Taliban have an office. The next round of talks is expected within the coming weeks. The talks have sidelined Afghan President Ashraf Ghani’s government. Also, Khalilzad has been pressing the Taliban to declare a ceasefire, something the insurgents have refused to do. Also Monday, a bomb went off outside a clinic in the eastern city of Jalalabad, wounding six people, all of them women and children, said Attahullah Khogyani, spokesman for the Nangarhar provincial governor. No group immediately claimed responsibility for the attack but both the Taliban and the Islamic State group are active in the area. By Amir Shah for the Associated Press. The Diplomat contributed reporting. Why Is Zalmay Khalilzad Such a Controversial Figure in Afghanistan? Khalilzad’s history is worth recounting, to give context to recent chafing at his tactics in pursuing peace.